Increase personal happiness and our collective wellbeing by changing how we measure progress and success. What we measure matters and affects our collective wellbeing. Gross National Happiness USA (GNHUSA) is a 501(c)(3) non-profit established in 2009 with a mission to increase personal happiness and our collective well-being by changing how we measure progress and success. We envision a society where all people, animals and the planet thrive. 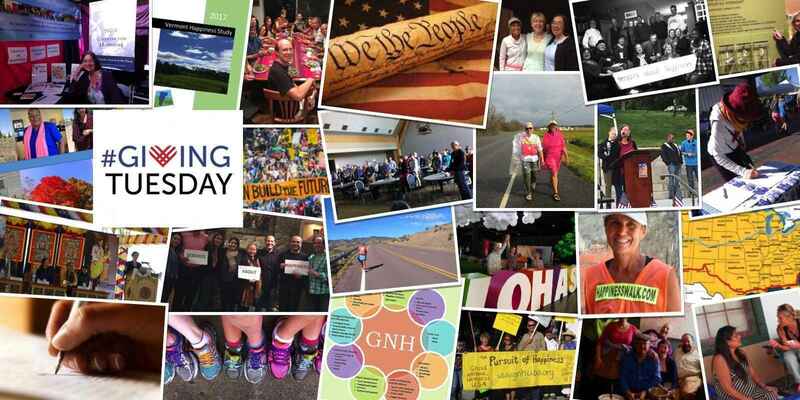 GNHUSA is part of the growing global happiness movement to establish an optimistic, just and practical path forward. The time has come to move beyond the single-focused GDP (Gross Domestic Product) model of production and consumption. We require holistic and inclusive metrics that reflect the complexity of both human beings and our systems. What we measure matters. Raising awareness about the urgent need to promote the conditions for societal wellbeing and cultivate greater personal happiness. Creating a new direction for the future by measuring what matters in all aspects of life. Inspiring personal action, sharing opportunities and tools for each person to create change. Informing policy development for maximum wellbeing. Sharing the great work of mission aligned individuals and organizations. GNHUSA takes a positive approach towards creating a healthy and sustainable future. Recognizing our abundant wisdom and tapping into our collective impact potential, we work with local, national and global partners to celebrate and create resonance between what we value and how we live. Our common values matter; there is more that brings us together than you think! Policy - We advocate for the utilization of expanded measures of wellbeing. We offer expert consultation to decision-makers to craft best practices for all people, animals and the planet. Research and Data - We gather, share and promote data with municipalities, businesses, non-profits, and state and federal government that systematically measures individual and collective happiness, utilizing proven matrices and tools (e.g. GPI, Happiness Surveys). Happiness Walk - Through an 8,000-mile educational and research project, we interview people around the country. We analyze this library of conversations to assess our shared and unifying values from which policies can be developed. Charter for Happiness - The charter is a personal commitment to a new economic model. We collect signatures to demonstrate growing public interest to policy and decision makers. We share resources and tools through presentations, workshops, publications, media, conferences and events. We connect mission driven people and organizations across the domains of happiness. We partner with global organizations, including the United Nations, scholars and policymakers, to grow a connected and collaborative happiness movement. International Day of Happiness - We organize Happiness Dinners and share related IDoH events to honor this day, as established by the UN in 2012, proclaiming happiness as a fundamental life goal. Please contact us directly at info@gnhusa.org for more information about our work and how you can get involved. We need to measure what matters to achieve new levels of happiness and collective wellbeing. Proud to be part of this great organization and important work! We applaud this work for a better vision of national -- and, relatedly, individual -- well-being, albeit a steep climb to bring to fruition! Gross National Happiness is the most important modern formulation of an age old concept: cooperation, not competition. Keep up the great work! It’s so very important right now! Best wishes for a wonderful visit to Seattle, the Emerald City!